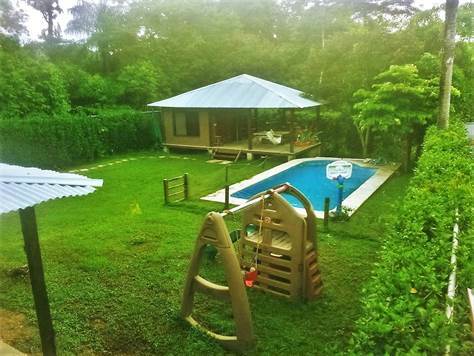 Vacation house located conveniently near to one the most famous beach communities in the Central Pacific, Punta Leona and also only 10 minutes away from Jacó Beach. It's right on the road that leads to the pristine and calm Playa Mantas beach. The house is spacious, the kitchen blends into the dining room and then the living room, a wide hallway leads to the 2 bedrooms and one bathroom, and there's a 430 sq. ft. corridor which wraps around the house. In the back there's a big yard, along with a 700 sq. ft. guest house, in which the bathroom is separated from the bedroom, in case other visitors need to use it while taking a refreshing dip in the 8.5 x 4.5 meters pool. This is one of the best deals you'll find in this area. For more information gives us a call today.